Wojciech Switala (born 5 October 1967 in Ruda Slaska) - Polish pianist. In 1990, he participated in the International Chopin Piano Competition award winning TIFC. He has made numerous recordings of solo and orchestra (including the National Polish Radio Symphony), as well as for leading Polish chamber music publications such as the Polish Radio, BeArTon, Dux. He graduated from the Academy of Mu-sic them. Karol Szymanowski in Katowice in prof. Joseph Stompel. In the years 1991-1996 he worked under the guidance of professors - Karl-Heinz Kämmerling, André Dumortier and JC Vanden-Eyndena. He is a laureate of international competitions in Bardolino (Italy, first prize), Competition. M. Long and J. Thibaud in Paris (II Grand Prix, Audience Award, an award for the best Europeans) Piano Competition in Montreal. On the twelfth International Piano Competition. Frederic Chopin (1990) received the award for the best performance of a polonaise and a number of prizes. 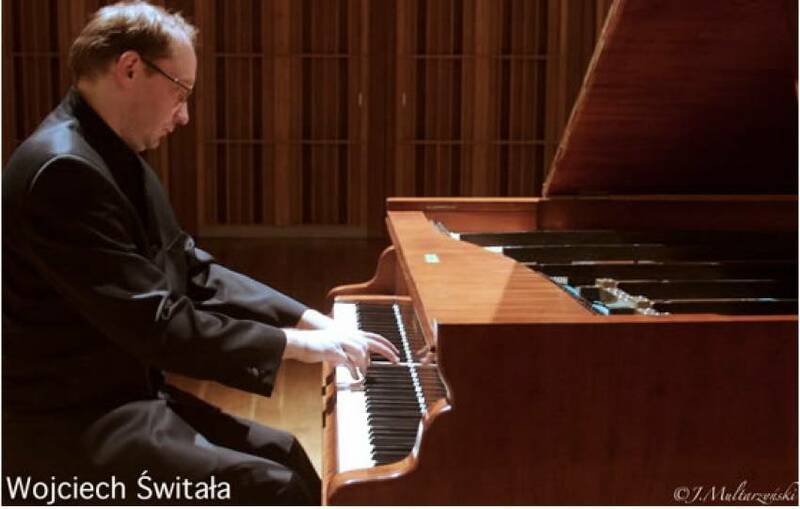 Wojciech Switala has performed in most European countries, Argentina, Morocco, the United Arab Emirates, Libya, U.S. and Canada. He has performed with most symphony orchestras in the country (including the Sinfonia Varsovia, Cracow Philharmonic, the Silesian Philharmonic Orchestra) under the baton of such conductors as John Krenz, Tadeusz Strugala, Volker Schmidt-Gertenbach, Chris Misson, George Katlewicz, Miroslaw Blaszczyk, Tomasz Bugaj. Apart from its soloist pianist willing to reach for it by performing chamber music with violinist Simon Krzeszowcem, Silesian Quartet, the Camerata Quartet, Quartet and Orchestra Royal Aukso. Wojciech Switala made a number of recordings with music by Liszt, Schumann and Chopin (including the Scherzo, Rollers and Ronda in the edition of the "National Edition"). Between 2000 and 2005, the two boards were awarded the "Grand Prix du Disque Frederic Chopin", and in 2002 awarded the prize "Fryderyk 2002". In 2003, the pianist has recorded both books of Debussy's Preludes, published by the label BeArTon, and together with Simon Krzeszowcem - complete Brahms violin sonatas for SONY Music Poland. Last fall he released his album recorded in the technology of Super Audio CD with songs recorded with Zarebski Royal Quartet. In the spring of this album will be released by the Fryderyk Chopin Institute Chopin Preludes containing recorded on a Pleyel piano from 1848. Since 1998, the pianist is also involved in educational work. He is currently vice-rector of the Academy of Music.